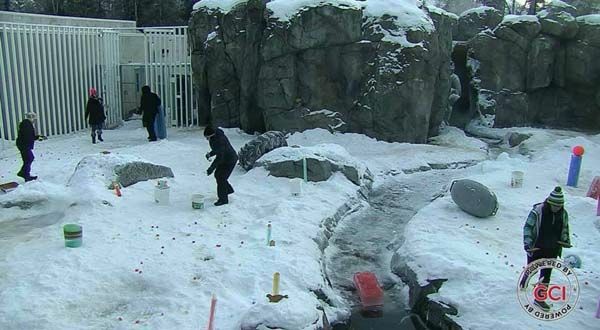 Every year the Alaska Zoo in Anchorage arranged a birthday party for their polar bears. The excitement was building for this event happening on the 19th of January! The keepers are overdoing themselves with the preparations for the big day. The cake was made of ice blocks filled with yammy things and all the ‘decorations’ are eatable, too! 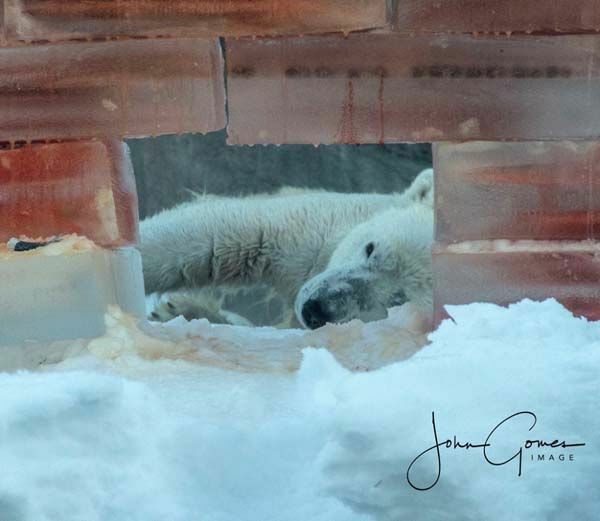 Cranbeary has begun making appearances in the main polar bear habitat. She and our male Lyutyik are alternating time as they enter the final stages of getting to know each other. We hope to have them together soon! Cranbeary was the first to meet the visitors who had come to congratulate her. It’s not so easy to decide where to begin! 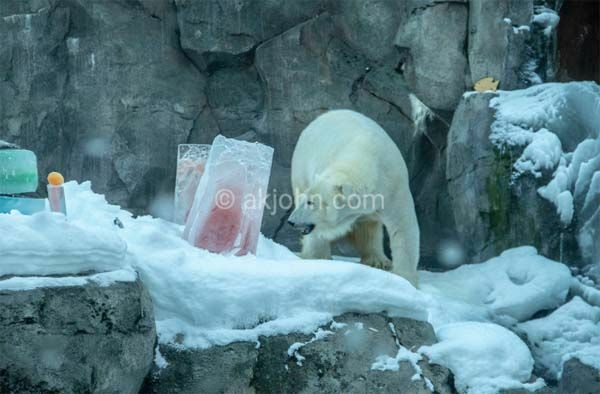 Oh bear, what a fantastic ice creation! Dear keepers, thank you so much! I’m overwhelmed! All the excitement made Cranbeary tired so a little nap was needed. Of course, even Lyituik was celebrated this special day but he had to wait until Cranbeary went in. Maybe we can see photos of him, too, later on. 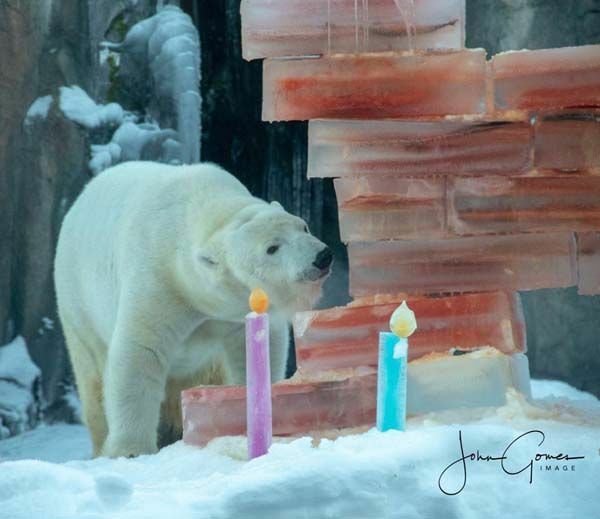 Knuti’s Weekly sends belated birthday wishes to Cranbeary and Lyituik and wishes them and their keepers a wonderful Winter time! 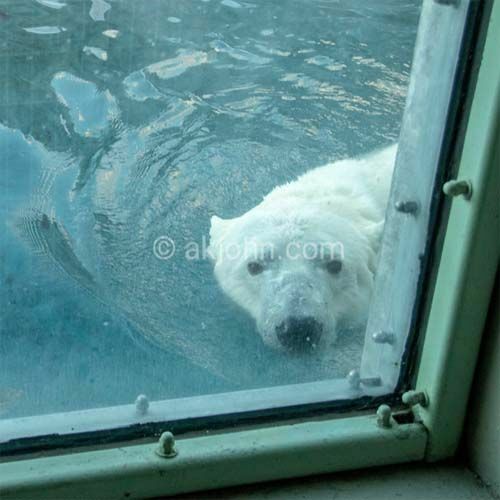 Thank you for the delightful report from the zoo Alaska. Cranbeary was overwhelmed of the all nice things around her. She decided to sleep next to her presents. Cranbeary is a beautiful lady. 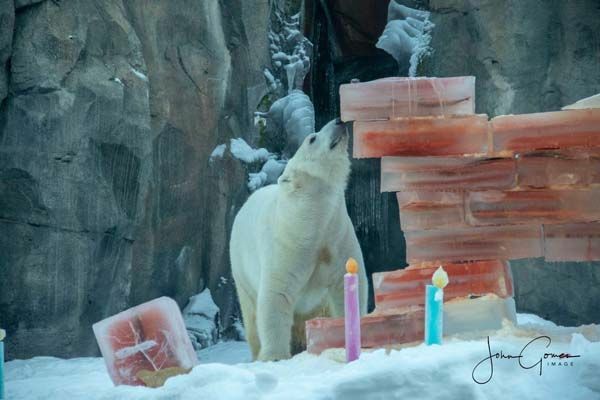 What a lovely birthday celebration by Alaska Zoo. I hope we will also see Lyituik tucking in as well. Cranbeary seems to have settled down very well. The last photo is awwwwww . . . so lovely! I am convinced CranBEARy is already nearly as much loved in the ALASKA ZOO as AHPUN was (without forgetting this wonderful former Zoo-Lady-president at all). Thank you MERVI for having brought these wonderful photos of John GOMES to us, your ‘KWM’-readers/-watchers. The party was great – so many gifts! Eine tolle Geburtstagsparty, da kann sich mancher Zoo in Europa ein Beispiel dran nehmen! 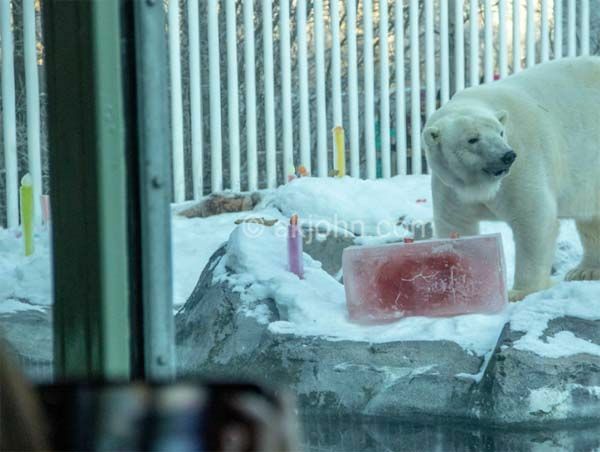 Thank you for bringing us these delightful photos of a smashing birthday party in the Alaska Zoo for Cranbeary. The keepers were very creative when they made this wonderful surprise for her. Like Britta-Gudrun wrote they could set an example for many other zoos! It was a fantastic birthdayparty with so many gifts! 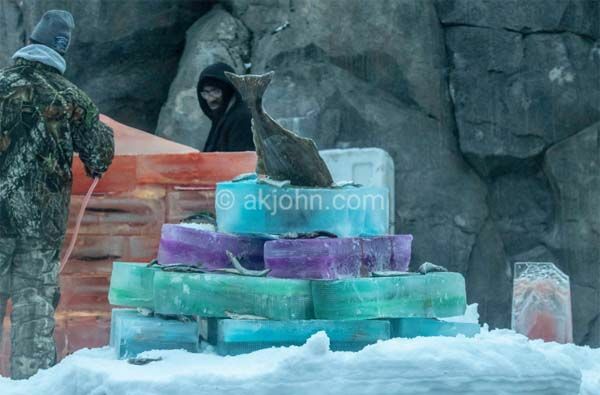 The great cake, made of colorful ice blocks, looks wonderful! Thank you for sharing this nice party story! 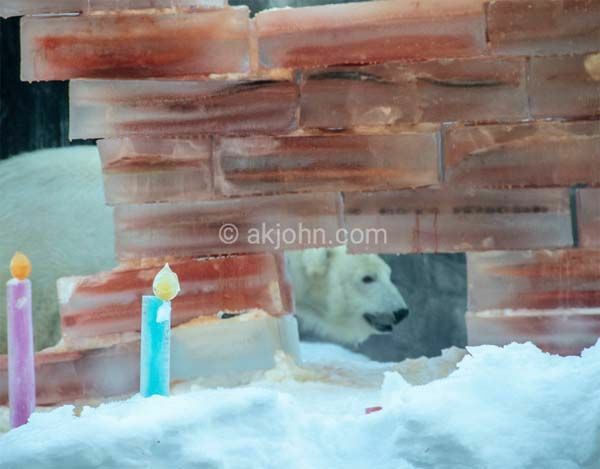 Wow, soviel Aufwand für zwei Eisbären. Ich habe mir das ganze Album angesehen. Da sieht man erstmal was da für Arbeit und Kraftaufwand dahinter steckt. Davon können unsere Berliner Eisbären nur träumen. Es muss ja nicht so pompös sein, aber hier wird ja überhaupt kein Geburtstag gefeiert, außer bei unserer Gorilladame Fatou. 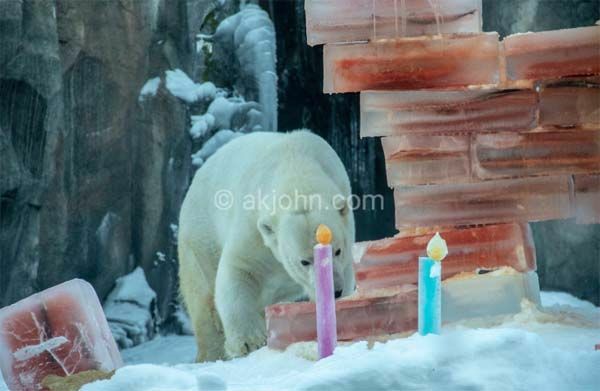 fantastisch was die Pfleger für ihre Eisbären alles zum Geburtstag aufbauen. 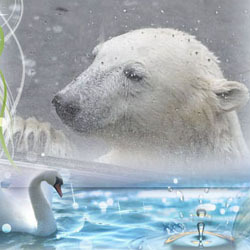 Da werde ich neidisch und würde mir nur ein bisschen für unsere Eisbären wünschen. Vielen Dank, daß wir dabei sein durften! The nurses had a lot of work to do. But the result is simply unique. The keeper had a lot of work to do. But the result is simply unique.